The West African slender-snouted crocodile is Critically Endangered! Project Mecistops aims to slow and eventually reverse its extinction trajectory through captive breeding, reintroduction, and support of our institutional partners in Côte d’Ivoire and throughout West Africa. 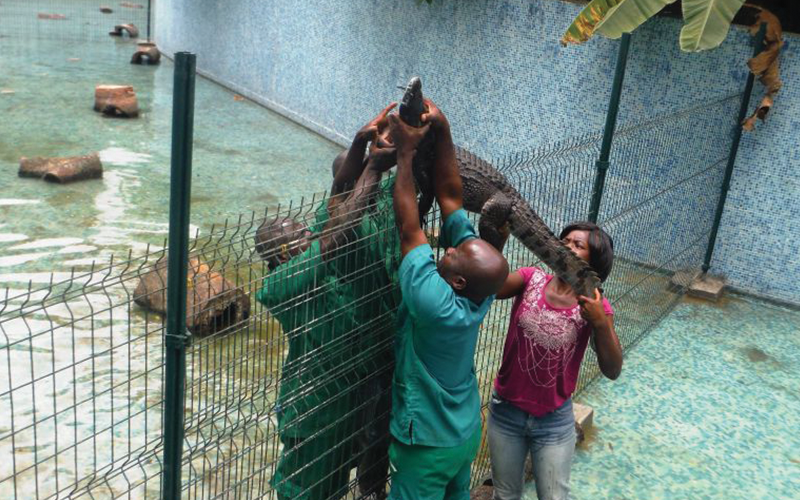 Maintain the permanent breeding colony of M. cataphractus at the Abidjan National Zoo to be used as a source population for crocodile reintroductions. 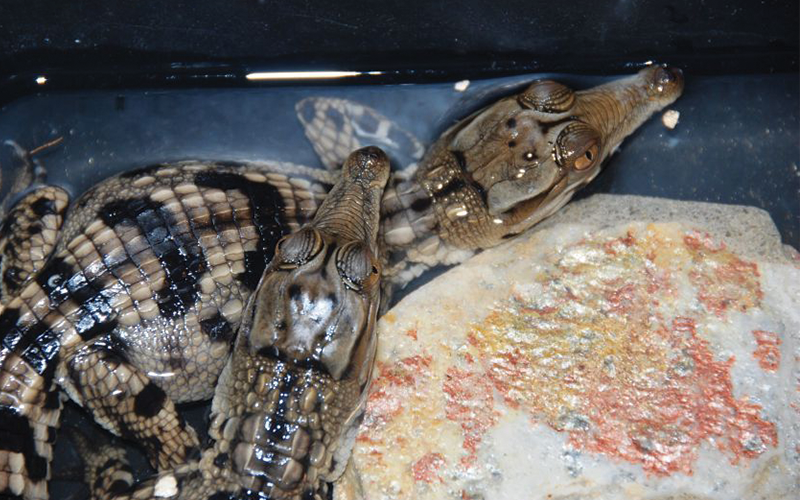 Reintroduce slender-snouted crocodiles bred at the Abidjan National Zoo at suitable sites in Cote d’Ivoire and neighboring countries. Build the individual (e.g., students, eco-guards) capacity for crocodile and biodiversity conservation in Cote d’Ivoire and throughout West Africa. Reinforce the institutional capacity for crocodile and wetland management in Cote d’Ivoire and throughout West Africa. 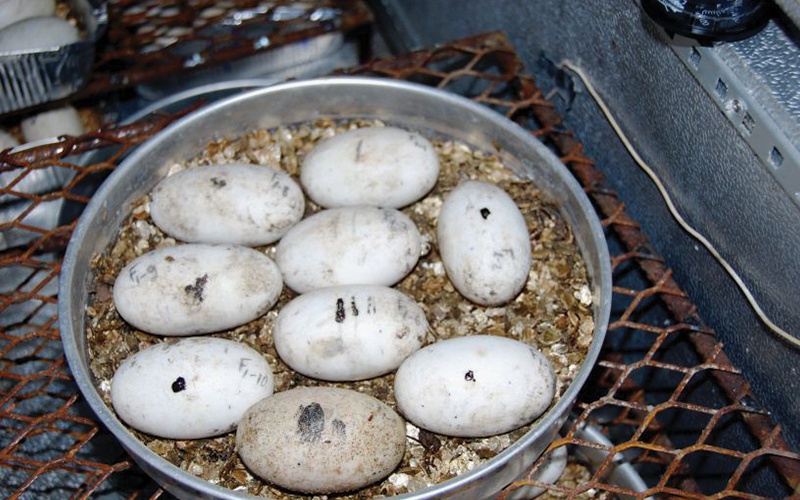 Conservation breeding is a focused captive breeding effort for species that are rare, going extinct, and/or already extinct in the wild – often with the specific purpose of reintroduction. West African slender-snouted crocodiles have become so rare, and with such fragmented wild populations, that captive breeding to produce individuals we can put back in the wild may give this crocodile the crutch it needs to start to recover. 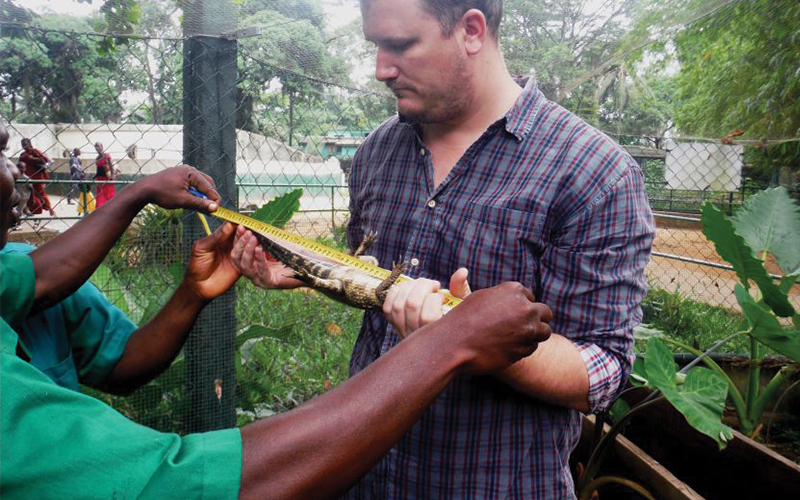 We revisited the Abidjan National Zoo in 2013 for the first time since 2006 to assess the potential of this colony and the Zoo for continued conservation breeding efforts. Since that first visit we have been continually supporting the Zoo to maintain this breeding colony to support reintroduction efforts. 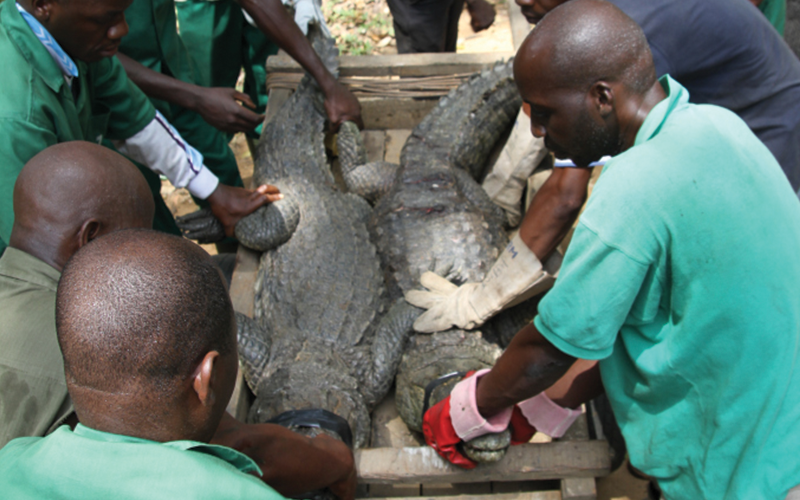 Project Mecistops helps the Zoo rehabilitate certain facilities, notably those for the crocodiles like the former breeding station, incubation and rearing facilities, and enclosures, ensuring both the technical means and personnel know how to regularly observe and assess the health and behavior of the crocodiles. We facilitate the establishment of reliable and regular food sources, training the crocodile keepers, and developing best practices management for crocodile captive breeding with the Zoo administration. West African slender-snouted crocodiles are rare, with heavily degraded and fragmented wild populations, meaning that a strategic reintroduction program may be the last chance for this species future. However, wildlife reintroductions, especially with species like crocodiles that are often considered as dangerous predators by local people, is not an easy task. It requires not only availability of individuals to be reintroduced, but also meticulous selection of reintroduction site based on biological, institutional, socioeconomic, and cultural criteria. Suitable reintroduction sites are those where threats to animals in general, and slender-snouted crocodiles in particular, are minimal or can be managed, where the existing habitat meets the crocodile’ needs (e.g., for feeding and reproduction), and where the risk of continued habitat destruction is low. It is also desirable to target areas where existing conservation management is in action (e.g., national parks or other protected areas) and/or where integration of local people is possible. Prior to releasing any crocodiles back in the wild, extensive surveys of existing populations and habitats will enable us to determine suitable locations for reintroduction. A key, pre-release activity for any species is assessment of the distribution, status, and demographics of current populations to best choose sites with the highest probability of reintroduction success while minimizing impacts on existing crocodile populations. We are using standard crocodilian survey techniques (e.g., spotlight surveys) to rapidly assess the abundance and distribution of M. cataphractus at a series of sites, largely focused in Cote d’Ivoire’s national parks and other protected areas. As part of these surveys, we are not only interested in existing crocodiles, but the suitability of the habitat (natural environment) and the local community activities (anthropogenic landscape) to support sustainable crocodile populations. 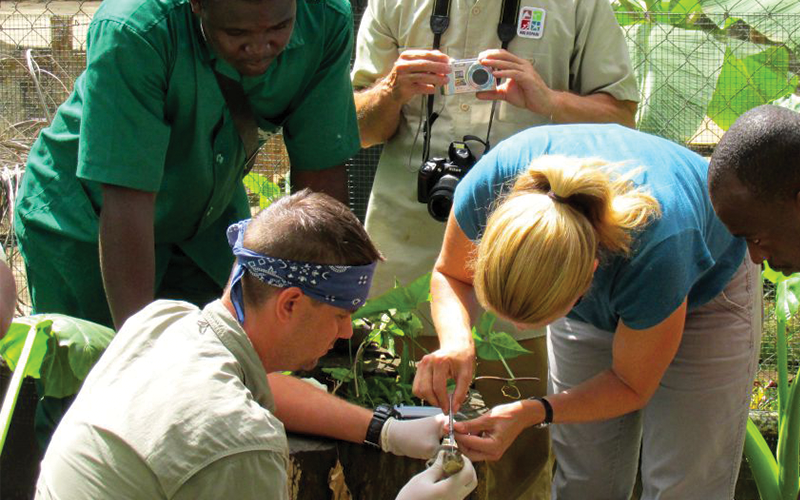 To become an active conservationist seeking to better manage species and habitats is not an easy task, requiring extensive training both theoretical and practical. Conservationists are jacks of all trades, often needing knowledge of evolution, ecology, animal behavior, and anthropology to assess threats facing endangered species and ecosystems and work with government and communities alike to develop appropriate management strategies. Project Mecistops and its individual and collective initiatives will only achieve absolute sustainability when well-trained Ivorians take over the management of their natural resources, including crocodile and other rare species populations. Because of this, Project Mecistops is engaged in training the future generation of scientists and conservationists in Côte d’Ivoire and throughout the region.  To do this, and through our various collaborations, we support the training of students and staff at our partner institutions by supervising MSc and PhD students and facilitating their training in the scientific method, data analysis, and publication. We conduct field training to teach and standardize methodologies for species monitoring and participatory conservation, practical training in animal capture and handling methods and training on approaches to community engagement in conservation. Africa in general, and West Africa in particular, has a long history with management and conservation of its large mammals, especially the mega-charismatic species like elephants and chimpanzees. Because of this, institutional structures for the protection of species exist. However, many endangered species, like crocodiles, continue to suffer heavy losses simply because they aren’t yet on the national agenda. Crocodiles are particularly affected by false impressions of big population sizes, misunderstandings about just how dangerous they are, and their widespread use as food or for the sale of skins. As the first project dedicated to the crocodiles of this region, we have our work cut out for us breaking down these barriers! Project Mecistops is committed to supporting national institutions in the development of strategies and protocols appropriate for crocodile management and to providing the missing data about the status of crocodile populations, their ecological requirements and the threats they face. We are working to ensure that existing biomonitoring programs in protected areas includes wetlands and wetland species. There are many successful models of crocodile management around the world, which we share with our partner Ivorian institutions as a basis for reflection on what can be achieved locally. One way we have tried to do this was by hosting the 3rd West and Central Africa Regional Meeting of the IUCN/SSC Crocodile Specialist Group in Abidjan in December 2015. 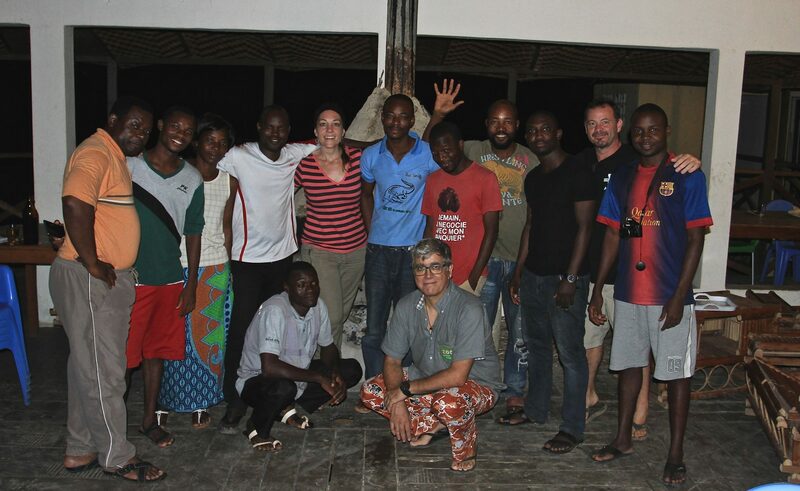 This meeting brought together over 60 crocodile specialists from throughout the region and the world to really highlight the importance of crocodiles in West African ecosystems and cultures.